It is easy to deal with being miserable as basically playing with computers all day takes your mind off it, and the rest of the time I am drunk! Do not try to play with computers when youare drunk though as you get mixed up wtih what keys you are typing ekcetera and then you have mistakenly deleted the Internet or such. It is OK really as I went to the shop there earlier and the Moon and Stars were out so I spent a pleasant while in the road looking at them. It is great that we have the Moon as otherwise it would be less intresting, also it would be awful lonely for the Earth not having company. It is fantastic at the moment as the Moon is really close to Saturn! If you look at it it is obvious what I mean. Also they are being followed across the sky by Leo, which is the bringer of Spring and although it is a lion, it is not the scary kind like you might think. It is more like Aslan. A cheerful lion that is concerned for your welfare. You would not think you could see an awful lot of stars in London, and indeed it is a whole different story when you get out into the country at night and the great glittering wheel of the Galaxy above you takes your breath away. Still if you can just get a bit away from street lights (like in the car park at the back of the little flat) you can see some lovely stars such as eg Sirius - above right of the big tree - and Rigel - top right corner and it is Orion’s left foot. This link is a nice example of what can be done in dark skies (with a long exposure). I got myself a new tripod while I was in Cornwall, and it is really good for night time photos and long exposures ekcetera. It is even better now my Dad fixed it so a tiny importint plastic bit does not drop out of the tripod when you open it up rendering it basically useless. A starfield in Orion, with the Great Nebula centre. This is applying a bunch of computer techniques I have read about eg Going Deep with a DSLR and Neutralising the Sky Background and using the Dcam Noise 2 Gimp plugin. Here is the original image so you can see the difference. Basically good astro processing comes down to a judicious use of the Curves tool, a little Selective Gaussian Blur, and lots of experimintation. You also need to take a lot of frames to start with as some of them will mysteriously turn out shite. 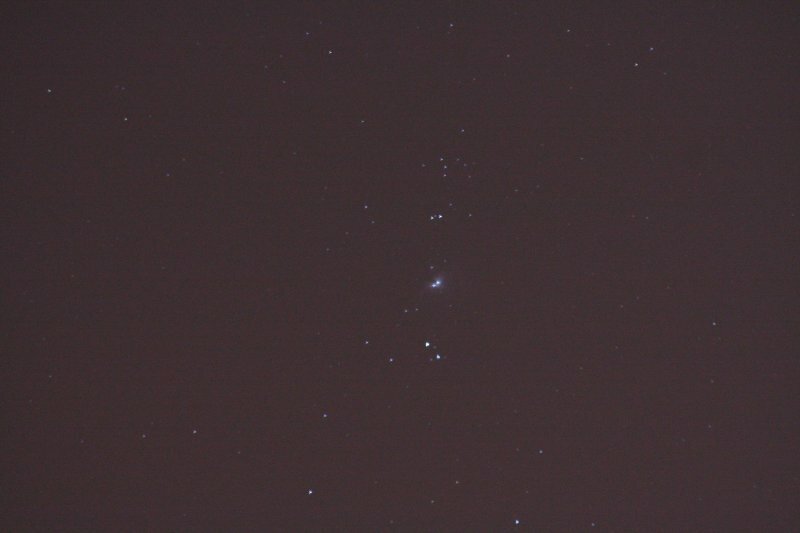 This is the best shot I have got of the Orion Nebula so far thanks to my new tripod. I read a good tip on the web somewhere as well which is not to turn up the ISO setting on the camera as you would normally think to do for low light photography, because it is not a ‘sensitivity’ setting as it is with film. Instead it controls the gain that amplifies the signal from the CCD, so you are not capturing any more photons - just amplifying CCD noise along with the same number of photons. I will use a low ISO with a longer exposure next time. Close-up of the nebula, enhanced as well as I can do and slightly blown up, but at this level optical artefacts start to dominate and obviously it does not really look like that in terms of nebulosity ekcetera. Still it is quite recognisable (see this gorgeous mosaic from Hubble for probably the most detailed picture of the nebula ever made). I am very pleased with the Dcam Noise plugin though as I expect even better results next time when I am using minimum ISO gain (hence minimum noise) on the CCD. There were 8 or 10 obvious hot pixels left which I removed by hand. I am also going to do some dark frame subtraction next time I go out; I did not have time this time because it was getting cloudy! A nice picture of the Moon which could have been even better except some hazy cloud was rolling in and consequently it is lacking a little definition. Still the ray structure of Tycho is clearly visible ( left, below centre ). The small bright spot just left of top centre is the crater Aristarchus. I hope you like it as I think the Moon is beautiful and sometimes I just like to sit and look at it out the window. Not in a scary way though.